--To plan on checking on that show The Slap. It's on my DVR but someone said I should read the book first. --To be going to the Victorian Tea the local historical society is holding on Saturday with my friend Jennifer and our daughters. People will be in period dresses. I will not, as I don't have one, but I can't wait to see others. And I love tea. I will take photos. Follow me on Instagram to see some! --To have refused to take my kids to see the Spongebob movie. They keep asking, I keep saying no. I have no guilt. There are some kid movies that I won't do. --To be annoyed with the Facebook noises that I hear when I'm on my phone. Sometimes I hear them, other times I don't. Am I going crazy? Is this a weird experiment, Zuckerberg? --To have a giveaway for the new Lego DVD called Justice League VS Bizarro League here. I watched the first episode of the slap. it was okay, I want to find out more though! you are funny with the school picture form, lol. I'm with you on the Facebook mobile noises... what the HECK happened?! It's awful. 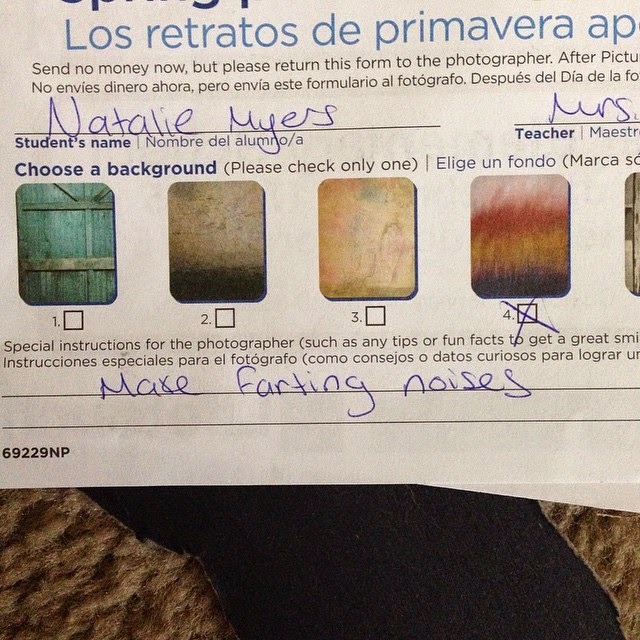 LOL about farting noises. My older son is amused by the scene in the Pitch Perfect 2 trailer that involves Anna Kendrick making a "fart noise" for the password to get into some house. I am totally with you on the Spongebob movie. You can't pay me to see that! UGH!!! My kids and I loved the Alexander movie though. So funny! I wouldn't take the to see Spongebob either, despise that show. Farting noise, no joke always make me laugh. Can't help it. LOL! Farting noises are always funny. Hmm...you might end up with 2 comments from me because my first one disappeared!!! SpongeBob has never been my favorite but my boys (husband included) love it and can quote pretty much every episode. I wouldn't have a clue how to dress in "period" for a Victorian Tea House. Awesome, about the farming noises! Can't wait to see everyone in period dresses. I will not see the Sponge Bob movie either. Good for you on the Sponge Bob movie. How exciting to go to tea! I love going to tea!!! Have fun! I haven't decided whether or not to watch "Slap". I'll be interested to hear what you think about it. 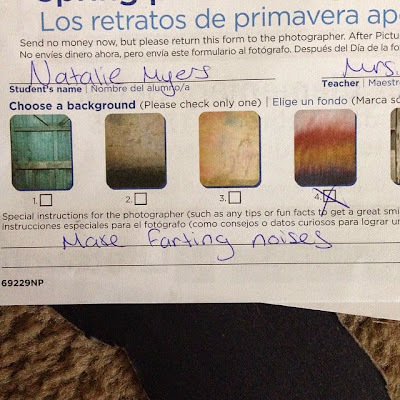 And I love your note to the school photographer! That tea sounds like so much fun! I can't wait to see those class pictures! Ok, I get it about the kid movies. Scarlet likes this movie "The Boxtrolls" and I hated it. I get the noises when my sound is turned on, but I usually keep it off. It freaks me out when I hear it because I'm not expecting it.